Battery-powered TaskMaster Tools run on the M18 Milwaukee battery platform which offers cross functionality with tools an installer may already have in their possession. ILSCO’s connector, conductor, and listing versatility with our 12-ton die taking and 6-ton dieless tools set us apart from the competition. 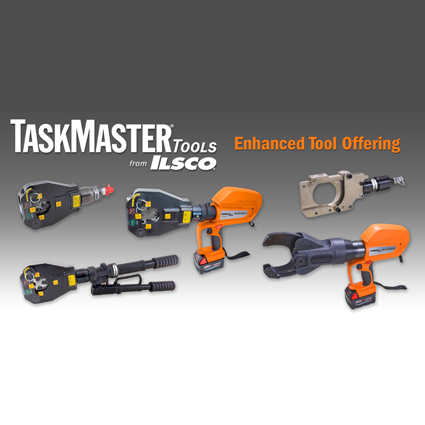 Our tools are supported by the TaskMaster®PRO service protection program which includes 5-year tool and 3-year battery warranties as well as a 5-day repair pledge. The series fits IPS pipe sizes from ½” through 12” and accepts ground conductor sizes from 4 – 4/0. UL Listed and CSA Certified. 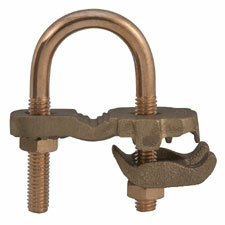 Includes silicon bronze hardware which provides superior corrosion resistance. Suitable for direct bury in earth or concrete. 90 rotation for installation flexibility. SGB-4 and GBL-4SS aluminum connectors designed to prevent galvanic reactions and enhance conductivity. UL 467 Listed and CSA Certified. Accommodate 4 – 14 AWG. Dual rated for copper or aluminum conductor. Electro-tin plated for low contact resistance. Lay-in feature provides ease of installation. Connectors feature stainless hardware. ILSCO®’s line SureCrimp® copper compression connectors were recently tested by Telcordia. Meeting NEBS Level 3 requirements is a testament to the quality and performance reliability of ILSCO copper compression connectors. Go to www.ilsco.com to learn about ClearChoice Connectors from ILSCO. NEBS approval required that ILSCO connectors perform satisfactorily under harsh test conditions such as vibration, lightning surge, salt fog, tensile and pull out strength & other conditions. Meeting NEBS Level 3 requirements is a testament to the quality and performance reliability of ILSCO’s connectors.